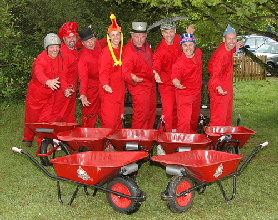 Formed July 2002 for a one off display to help celebrate the Queens Jubilee we believe we are one of the the original Red Barrows display teams. The demands for repeat displays has grown and we now perform regularly for charity. The Red Barrows perform for charity and each member pays their way, our main effort supports “Breakthrough” the breast cancer charity. Checkout our display dates and come and support us or get in touch if you are planning an event of your own.